This weekend marks a new milestone for Doggie boy as it is P1 orientation for him. It will be his first formal introduction to the Primary school which he will be going to from 2013. It will be a new learning environment for him as he enters the same school that his elder brother is currently studying in. Doggie boy character is slightly different from Monkey boy. He is not as outspoken and forthcoming as his elder brother. Being more shy and reserved in nature it has been quite difficult getting him to open up and speak up. It takes him a longer time to process new information and there is need for more revision on the same topic for him to be able to register what is being taught to him. Doggie boy needs more one on one focus as compared to his brother and more breaks in between study sessions. I have tried a few different methods with him and found that he relates better to visual stimulation as compared to just pen and paper talk. Taking into consideration his attention span we came up with a schedule which was agreeable for the both of us. I do not specify that we need to cover all these items per day but the bulk of it. I believe in frequent revision and having a set schedule will make it easier for Doggie boy to adjust to the new study/ play timetable that he would be having next year. He gets to choose which activity he would like to do first. The only requirement is that he completes the assigned work before bedtime. I try to cover all three subjects with him during the weekdays however sometimes time doesn’t permit or he is too tired for the day we will cover less. I do a combination of direct and incidental learning with him using a variety of teaching materials. Kids at this age are unable to sit still for long period of time and require different mediums to keep them stimulated. We go through a selection of activity books, assessment books, flash cards, game sets, online educational programs, iPad Apps and hands on learning each week. I also infuse learning into the everyday chores which he does around the house. For example, while hanging up the clothes I may ask him to describe the particular shirt that we are placing up onto the laundry poles in both English and Mandarin. I may also throw in a simple mathematical question for him in the mix on certain occasions to get his mind thinking on the go. Doggie boy does have play dates with other kids outside school. This gives him chance to interact with more kids in a range of ages and learn to be able to relate to different personalities. While outside with Doggie boy I do let him order food, interact with the waiters and pay for our groceries. This gives him the chance to experience handling cash and interacting with other adults. It also gives him a chance to build up his confidence. It is also indirectly preparing him for show and tell which he would be facing next year. How do you reinforce learning at home and while outside? In the next installment I will be touching on the physical preparations I am doing with Doggie boy. Thank you for sharing. Is he in the morning or afternoon session? What time does he sleep / should they sleep? I asked because Dumpling’s potential primary school still has pm sessions. I see that his revision time basically starts after dinner and it’s a total of 2 hours. If they have dropped their nap, then their bedtime is quite early? He will be in the PM session next year. He will be sleeping about 9.45pm¬10pm at night. Yes study time starts at 8pm for him and stretches 1.5hr-2hrs in the night. There will be another study session in the morning for him from next year before school. 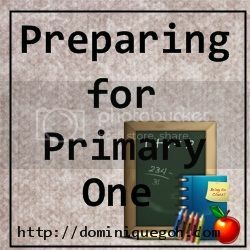 K will take another year before going to Primary one but this is very useful Dominique! I am going to keep in mind until the time comes. 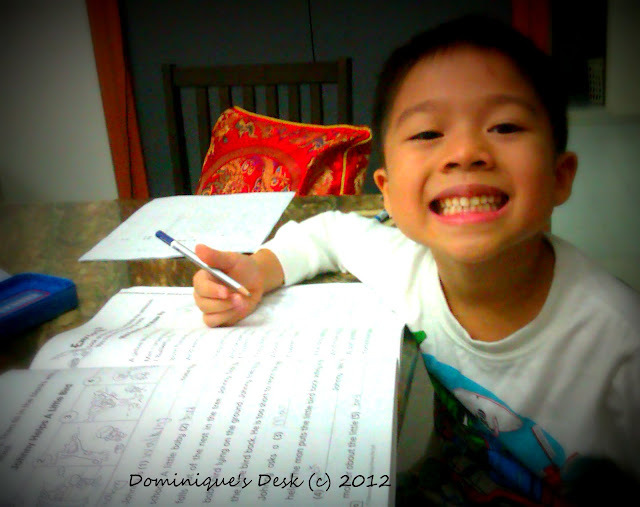 Right now K is still on KG1 and even for a kindergarten he has a quite packed schedule from Monday to Friday. Morning class session and afternoon extracurricular. He learns Mandarin too you know! He does his homework in the noon time afterschool before going to his extracurricular class. Comes back home at around five, eats dinner and off to bed by seven or eight. We recount his subjects on the way to or from school or in every spare time we have. Not yet any specific time to do revision but once he gets to higher level, revision time is a must. My son is just two and a half. I try to teach my son using things around the house — like ung colors ng shirts sa sampayan or the color of his toy cars and the likes. My two oldest girls are in preschool and the youngest is 18 mths. Although we do letter and number workbook exercises, I find that for my children, the best way they are learning right now is through play. Imaginary play, cooking, hide and seek, play dates with other children, chore charts for the home, unloading groceries, grouping items around the home, etc…..We’ll be getting more into the academics later. Thanks for sharing. Right, kids have such short attention spans that it’s good to infuse learning into daily chores/activities. When I want my daughter to do her homework, I try to make games out of it. Somehow, it works :). She tends to learn better when having fun. We have a 2 year old who has been attending a toddler & mommy class and though he was very shy and reserved at fist he is slowly learning to be a little more outgoing. We are hoping to improve his socialization skills and build his confidence in large groups. I love your approach with the agreed upon schedule. From personal experience kids are more willing to participate as well as complete things when they are involved in the planning. Having a set schedule make for good studies! I have to go work some piano practice into our own scheduling! I like the impromptu way u teach your kids.